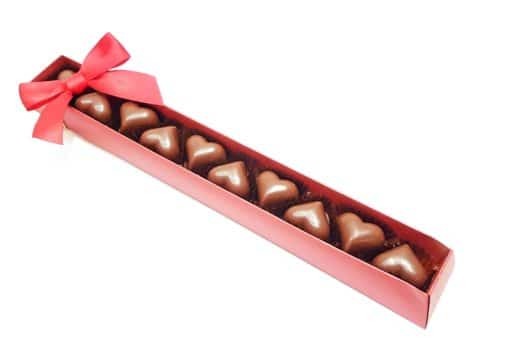 Luscious soft salted caramel heart chocolates in 45% cocoa single origin milk chocolate. For these limited edition hearts we use 45% cocoa milk chocolate from the Vietnam mekong delta married with Jersey cream from Ivy House farm, Beckington on the Wiltshire Somerset border. Presented in Plastic free packaging. 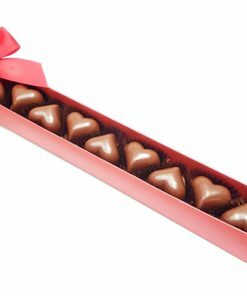 10 Milk chocolate hearts 90g. Luscious soft salted caramel heart chocolates in 45% cocoa single origin milk chocolate. It took us many trials in Diana’s copper jam pan to perfect our soft buttery caramel with local Jersey cream and the finest sea salt. Yum! For these limited edition hearts we use 45% cocoa milk chocolate from the Vietnam mekong delta produced under the cacao trace program. Our Jersey cream comes from the Bowles family Ivy House farm, Beckington on the Wiltshire Somerset border. The Mekong delta region, also known as ‘Little Venice’, is the major cocoa-producing region in Vietnam. The Trinitario cocoa is a variety that has fine aromas perfect for making our rich, high cocoa milk chocolate. Made in a kitchen that handles Nuts, Wheat, Peanuts, Sesame and Soya. 100% Biodegradeable and home compostable – plastic free packaging.. The box is made in the from card. Please recycle it in cardboard recycling. The clear film wrap is home compostable from wood pulp it will break down to organic matter in around three weeks. The brown paper postal bags we use can be recycled in paper recycling. The large white pillow cushions are made from recycled potato peelings and are home compostable.